We are happy to answer your question. Mandatory field Security question* Please calculate 7 plus 4. 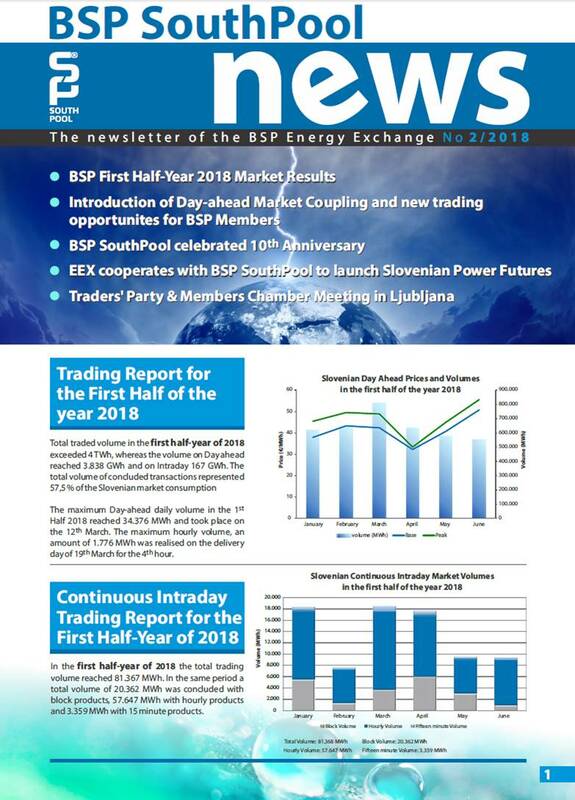 BSP Energy Exchange publishes BSP SouthPool news, The newsletter of the BSP Energy Exchange. The newsletter includes the overview of the trading for the pervious quarter and other important news. I agree that BSP d.o.o., Dunajska cesta 156, Ljubljana, shall use your personal data in accordance with the applicable legislation regulating the protection of personal data, exclusively for the purpose of providing the newsletter of the BSP Energy Exchange. Your personal data shall be handled and protected in accordance with applicable law, whereby BSP d.o.o. shall not use your personal data without your consent, transmit or make use of it to third parties or institutions, except in cases provided by law. Transmitted personal data shall be appropriately stored and used only as long as this is necessary to achieve the purpose of collecting personal data. If you no longer want either to receive the newsletter of the BSP Energy Exchange or want to request correction or deletion of your personal data, please email us at info@bsp-southpool.com. Mandatory field Security Question* Please add 2 and 4. Would you like to know more about your trading options? BSP enables you to trade Day-ahead and Intraday on Slovenian market. Additionally there is an increasing interest among members to participate also on long-term auctions. BSP Energy Exchange LLC © Copyright 2019 All rights reserved.